As God's eternal life flows through us, we learn to let go of our pretensions of control and rest into the new life offered in Jesus Christ. This book is an invitation for you to become nonresistant to this movement of God's love for you and the world. Through a variety of sermons and meditations, Sider and Villegas bear witness to a grace that disarms our guardedness and makes room for us to fall into the love of God. Preaching becomes a dispossessive practice, as each person is invited to give and receive God's transforming power. The proclamation of the gospel, Villegas and Sider say, should display the priesthood of all believers. Thus, the call to preach belongs to the whole congregation and its conversation rather than to the lone preacher and her (or his) sermon. 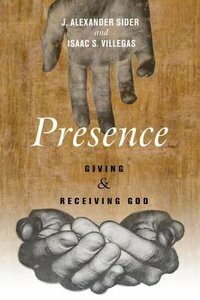 Presence: Giving and Receiving God draws on the Mennonite tradition of the Zeugnis (conversation) to explore how the preached Word echoes through all of our voices. J. Alexander Sider (Ph.D., Duke University, Durham, NC) is assistant professor of religion at Bluffton University. He is general editor (with Chris K. Huebner and Peter Dula) of the Polyglossia: Radical Reformation Theologies series, and the author of To See History Doxologically: History and Holiness in John Howard Yoderf's Ecclesiology.